Garrett Gray is originally from northern California and relocated to the Northwest in 1996. 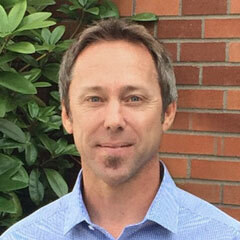 He started working in the medical field at Harborview Medical Center assisting anesthesia in the operating room. He graduated from the Physician Assistant Program at the University of Washington Medical School (MEDEX) in 2012. Following graduation, Garrett started his career with Proliance, and brings experience from general surgery and orthopedic surgery to the ProOrtho team. Currently, he works with Dr. Addison Stone in minimally invasive spine surgery and sees patients in clinic with spine-related disorders. Together they work as a close team ensuring the patient’s expectations and needs are met in a detailed and timely manner. Garrett enjoys time at home with his wife and daughter, snowboarding, surfing, fly fishing and outdoor activities. "Dr. McAllister is a good doctor but also a good man, he is caring and very kind."